A portrait of rural life in picturesque southern Ontario on horse farms ranging from the traditional Mennonite to modern organic. 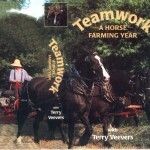 Presenter Terry Veevers illustrates his conviction that horses can truly play a part in the modern agricultural era. demonstrated, culminating in a winter sleigh ride. Combining the majestic power of Canadian, Belgian, Suffolk Punch horses with progressive modern machinery, this DVD breathes new life into traditional farming whilst retaining the simple beauty of horses working in harness.